When looking for outfit inspiration, I usually turn to female celebrities . I adore so many style icons such as Jessica Alba, Cameron Diaz and Jennifer Anniston. The one that stands out the most is Kim Kardashian. There is no denying that she is a beautiful girl with gorgeous curves. She knows how to mix high-end and low-end pieces, dressy elements and casual items. Best of all, she loves her body. She embraces her curves and is comfortable in her own skin. I am a sucker for reality TV shows. You bet I will be in front of the TV at 10:00 EST Sunday night watching “Keeping Up with the Kardashians”. Although she is not petite but I adore her style and fashion sense. I chose Kim Kardashian’s signature look for Petite Fashion Challenge #3. Her go-to outfit consists of a black boyfriend blazer, skinny jeans, oversized bag and statement jewelry. She has been spotted many times wearing her signature look. It’s not hard for me to search for one of her inspired outfits. I found this photo from Google images and immediately in love with her outfit. It’s casual but yet chic and stylish. 100.00. I know some ladies have struggled with this challenge including myself. Please show them your supports by visiting their blogs (listed below) and check out their fabulous outfits. I hate missing out on these challenges! :( maybe next time. good job on the look! Sydney-- you look fantastic!! you pull off the bf jean quite well. i'm also loving your long hair...so girly and feminine! Kim Kardashian always looks amazing..especially with those curves!! Your version is really good! I love how it's all under a hundred bucks. :D Btw, thanks for your AE blazer suggestion a while back..but their XXS sold out and I wasn't sure if the XS would fit me well. Yours looks fantastic on you though. Wow, your reader did a great job! I never even thought of Reese Witherspoon! 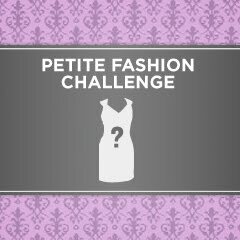 Oh, and according to the Petite Fashion Challenge Sign-up List, Petite Gorgeous will be the next host! I love Kim's style and I think you did a great job replicating it! I really like your boyfriend blazer, I wanted to get the one that they offered this season but it was sold out in small sizes so quickly! Kim Kardashian has an amazing fashion sense and I love your recreation of it! Those jeans look really nice -- if only those stores hadn't all closed down! Thanks so much for hosting the challenge. This was super fun! Soo did a great job as well using Reese as an inspiration...so chic! sorry, could you add my blog? You did a great job! Your frame pulls off a long blazer jacket really well! You've definitely embodied the style and chicness of Kim K :) I love the heels with the outfit! Thanks for hosting the challenge - it was a fun one! Hi Sidney. Great copy of Kim Kardashian's outfit! I really admire the work here. I see you have already linked me. Please take the link out. I was not successful in recreating an outfit that works. :( Time constraint and a stupid cold. Will check out everyone's work now. So exciting! Love the blazer and thanks for hosting! I'm having so much fun going through all these. Thanks for organizing by the way! We had a lot of participants this time! Ladies, I'll correct all the links shortly. Thank you all! Amazing recreation. That jacket looks almost like the same jacket Kim has on. This challenge is a really tough one for me. PS - Soo looks great in her Reese recreation! Your hair looks so great long, I love it! The outfit is fabulous too, I'm definitely going to have to get a boyfriend jacket now for sure!! Another great turn out for PFC! Thanks for hosting! Great job on the outfit too, it's definitely very close to the original! Love Miss Kim's look and you did a great job of pulling it off; super cute blazer! Another great set of looks! I can't believe I missed another one: I vote for everyone to post the annoucement on their own blogs the day it comes out. Let's build this up! Thank you again for hosting...linking to each blog is hard work! You did a great version of Kim K's look! You look gorgeous and I love the blazer with the distressed jeans. I'd never think to do it but it looks great together! Love it! I love her style too, I have several of her outfits in my lookbook. Great job! i love how the blazer fits you so well.. the satin lapel is such a nice touch too! I love your take on Kim Kardashian's outfit! I was particularly excited about this challenge to see what other petites came up with. LOVE it love it love it!!! I wish I could have recreated this look too but my blazer collection is seriously lacking! I love those Kardashians! Oh also! Kim is actually considered petite! She is only 5'2" or 5'3"! Kim is 5'2'', and it's pretty obvious. She says she shares clothes with her sister Courtney who is 5'1''. How is she not petite? you look wicked cute in that blazer! It fits you VERY well!! Love all those neutral colors, esp the light torn jeans w/the camel shoes! You rocked it well! Oh! I love the look you re-created! You look amazing! What a great weekend outfit! I love Soo's outfit, as well. Her tights are so cute! I love all these blazer looks! Thanks for putting in all the work to host PFC#3! Thanks for hosting such a fun challenge! I looked through most of the entries quickly and will take a second run through over the weekend. I like how your shoes aren't as busy as Kim Kardashian's, which I feel cuts her legs off a bit and makes her proportions a little off. Your blazer looks amazing, makes me want to get one as well. Soo's outfit is super adorable! I love the inspiration photo as well. I love the details on her tights!! I love the blazer look on you and Soo! I feel like running out and buying that exact AE blazer you have on :) especially since the price seems more affordable than most blazers I've seen. The AE blazer looks very good on you! I didn't know that cuffing jeans can still create a very stylish look. I found you via Khatu.